Teachers are change agents. They encourage, motivate and lead students to new paths of discovery. Whatever the subject, teachers make a profound impact on their students, and society as a whole. Music teachers have the added joy of fostering creative energy from their students and helping to nourish innate talents and gifts. Individuals with a passion for teaching, for shaping the minds and motivating students are needed today more than ever. A Master of Education degree gives teachers a broad background from curriculum to administration and is intended for educators that strive to increase their knowledge, for the purpose of expanding their career options. 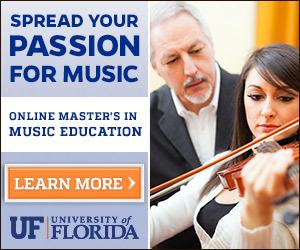 A Master of Music in Music Education degree on the other hand, provides the core teaching models of a Master of Education, but partners it with specific musical educational techniques. Teachers with a musical background will learn practical applications of education theory coupled with specific instrumental, choral, and music history in a Master of Music in Music Education degree curriculum. A degree focused on music education often includes courses on philosophy, sociology, history and psychology of music. Additionally, electives may include various musical genres from classical to contemporary and courses on trends, research and techniques for music instructors. All of this partners together to help teachers create a positive learning environment for students to learn music. For those that pursue a Master of Education degree, the curriculum has a broader focus for instructors that opt to teach subjects other than music. Most graduate programs include theoretical teaching strategies, strategies for teaching performance, technology use in the classroom and school organizational change. This degree program can assist with career growth in education management, curriculum development, and other avenues. The legendary Ray Charles once said “I was born with music inside me. Music was one of my parts. Like my ribs, my kidneys, my liver, my heart. Like my blood. It was a force already within me when I arrived on the scene.” At an early age, he showed promise and by the age of 15, he was playing professionally. While not a typical life, his talent was fostered during his early childhood at the Florida School for the Deaf and Blind. Ray Charles’ music teachers made the difference in his life, and in all of ours. Today, professionals graduating with a Master of Music in Music Education degree have the opportunity to challenge, motivate and teach the next Ray Charles, Les Paul, or Louis Armstrong.